The Data Integrator is a fast and powerful graphical interface that can combine and export data from multiple tracks simultaneously. Like the Genome Browser and Table Browser, it can combine data from the browser database, user custom tracks and track hubs. include all columns of all data sources in your query, or only the columns that you select. query genome-wide (provided that the results are not so large that the connection times out), or only for your regions of interest. view results in your web browser window, or download to a local file, optionally compressed by gzip. The Data Integrator does not yet have many of the features of the Table Browser tool. For example, if you want to retrieve DNA sequence or GTF format, you will need to use the Table Browser. Specify the genome assembly from which you'd like to retrieve the data by choosing the appropriate organism using the group and genome menus, then selecting the assembly version from the assembly menu. Note that changing the group menu causes the genome menu to refresh, and changing the genome menu causes the assembly menu to refresh. Assemblies that are uploaded as part of an assembly hub will be available under the hub's name in the group menu. The Data Integrator allows you to choose the genomic regions for which you want output. To display all of the data records for the selected track(s), select genome from the region to annotate menu (not available for certain tracks with restrictions on data sharing). To restrict the data to a specific position range, select position or search term from the region to annotate menu and type or paste the position into the box. Some examples of specific positions include a chromosome name (chrX), a coordinate range within a chromosome (chrX:100000-400000), or a scaffold name. 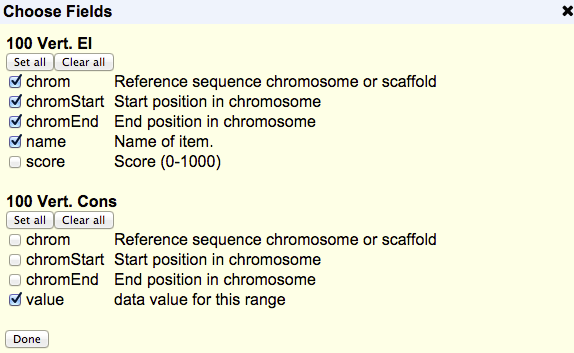 To look up the position range of a genomic element -- such as a gene name, an accession ID, an STS marker, etc. -- or keywords from the GenBank description of an mRNA, select position or search term from the region to annotate menu and then type your search term into the box. For assemblies that have gene annotations, autocompletions of gene symbols are offered. If your search term matches more than one track or item, then a pop-up will appear with matching items and positions; click an item to select its position. To query multiple genomic regions, select define regions from the region to annotate menu and then enter up to 1,000 regions in a 3- or 4-field BED file format or as chrom:start-end position ranges. The track group menu shows all the annotation track groups available in the selected genome assembly. The names correspond to the groupings displayed at the bottom of the Genome Browser annotation tracks page. When a group is selected from the menu, the track menu automatically updates to show all the annotation tracks available within that group. To examine all the tracks available within a certain group (e.g., all gene prediction tracks), select the group name from the track group menu, then browse the entries in the track menu. Each connected track hub will be listed as its own group under the track group menu. Clicking the "View table schema" link opens a new web browser tab with the Table Browser's schema page which describes the data fields.
. You may add up to five tracks. Some tracks are not available when the region is set to genome due to the data provider's restrictions on sharing. See the Selecting Data Sources section for more details. You can rearrange your data sources by clicking on a track name and dragging it into the desired order. Items are output based on their overlap with the first listed track. The order of the tracks will also determine the order of the fields in the output. Fields from tracks higher in the list will appear first in the output. to bring up a checklist of all fields from all selected data sources. By default, every field is selected. You can choose the columns you want in your output by checking the box next to that field. Additionally, you can add and select fields from up to four related tables. See the Configuring Output section for more details. to display the results of the query in the web browser window. The results will be displayed as tab-delimited text. Download results as a file by checking the box next to Send output to file and entering a file name into the box. The output file can also be compressed by gzip. The Data Integrator allows you to select up to five data sources to intersect. These data sources can be tracks provided by UCSC or your own data uploaded using custom tracks or track hubs. Only positional tables, such as BED, wiggle, and genePred, are currently allowed in the output. Other formats such as MAF or BAM are currently unavailable in the Data Integrator. The order of your selected tracks also affects the order of fields in your output. Fields from tracks that are higher up in the Configure Data Sources box will show up before tracks that are lower in that box. Using the same order of tracks seen in the previous example, this means that fields from the UCSC Genes track will appear first in the output, then fields from DNase Clusters and lastly fields from Conservation - 100 Vert. El. However, your tracks aren't limited to the order in which you selected them, and you can rearrange the order of your tracks at any time. To do so, just click and drag a track to a new position in the list. A track can be removed by clicking the "X" next to it. Some data providers stipulate that their data can be browsed visually in the Genome Browser, but cannot be provided for download via the Table Browser or Data Integrator. Tracks from those providers do not appear in the track menus. Other providers allow queries within specific regions, but not genome-wide queries. Their tracks appear in the menus, but are grayed out when region is set to genome. If we were using the Data Integrator to find the DNase peaks that overlapped with the gene in the UCSC Genes track, we would get all of the visible peaks in our output. Additionally, items are output regardless of the amount of overlap. This means that if there is even a single base of overlap between two items, they are included in the output. , you should see a section labeled "Related tables" below each track. This drop-down menu allows you to select and add related tables to your output. 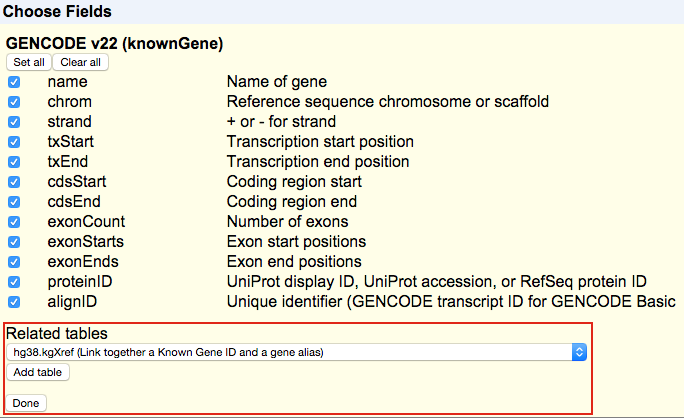 Note that not all tracks in the Genome Browser database will have related tables. Also, some tables may be unavailable when region is set to genome due to the data provider' s restrictions on sharing. If no "Related tables" section appears for a particular selected track, then there are no related tables for this track. at the bottom of the dialog box to finish configuring your output. to begin downloading your file. Note that for wiggle tracks, the "Value" field is averaged across the region of overlap. In the future, we intend to add an option to output all of the data values in that region of overlap.